With the manifestation of Jesus Christ as the eternal Son of the eternal Father, the doctrine of the Holy Trinity, which was implicit in the Old Testament, becomes explicit in the New. 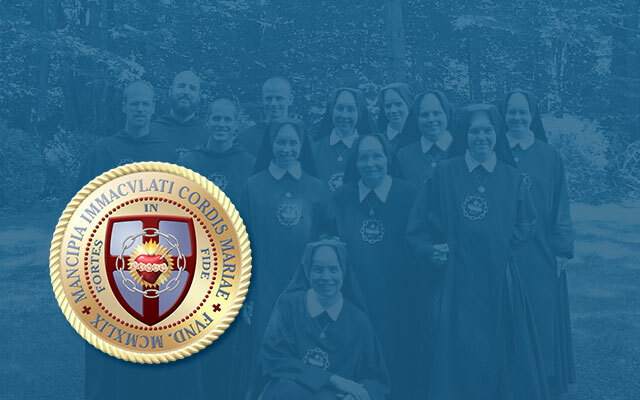 Now we know that the true God is a community of consubstantial, coequal, and coeval Persons, all worthy of the highest cult of adoration, thanksgiving, reparation, and petition. Before the revelation of God in the Flesh, we did not have such knowledge. That mystery by which we know the mystery of the Trinity — the Incarnation of the eternal Word — was itself an altogether new revelation, a fulfillment of the mysterious prophesy of Jeremy, “for the Lord hath created a new thing upon the earth: A WOMAN SHALL COMPASS A MAN” (31:22). That new thing was beloved of the holy angels and hated by the demons. Satan’s fall was caused by his rejection of the economy of the Incarnation, with its consequent crowning of that Woman as Queen of the Angels — his Queen. In his demonic hatred of that Woman, he seduced her precursor, Eve. And in his preternatural hatred of that Woman’s “seed” (cf. Gen. 3:15), he hates all children. Under his influence, therefore, the pagan world gave us the diminution of woman to the status of man’s sexual plaything. (A role she was largely spared in Christendom owing to the cultus of the Blessed Virgin Mary, cf., Orestes Brownson’s “The Moral and Social Influence of Devotion to Mary.”) And in the darker sort of paganism — the more clearly diabolical kind — we see the wicked cult of child sacrifice. Thus the Canaanite god, Moloch, and the Punic god, Baal were each the recipient of a cult that included child sacrifice. The former cult was practiced by apostate Israelites, who murdered their own children, which they were specifically commanded not to do in the book of Leviticus. The cult of the latter, Baal, was one of the reasons the Romans sought to destroy Carthage. Pagan though they were, the Romans were not so corrupt as to fathom child sacrifice, and their orators cited infant sacrifice in their anti-Punic rhetoric as a reason why Carthage must be destroyed. In spite of a fashionable modern attempt to rehabilitate the ancient Phoenicians’ reputation, recent archeological evidence shows that the Romans were right; these people really did sacrifice their children to demons. Closer to home, while the Aztecs practiced various kinds of human sacrifice, the worship of Tlaloc, their god of rain, water, and earthly fertility, specifically demanded child sacrifice, as did certain other of their cults (mentioned at various points here). We know that the holy Virgin of Guadalupe came personally to evangelize the Aztecs through the instrumentality of Saint Juan Diego and his tilma. Fighting diabolical fire with fire of a heavenly sort, the miraculous image of Guadalupe is an ingenious pictogram of a pregnant young Queen defeating the Aztec pantheon. And her beautiful words to Saint Juan Diego show just how tender and loving a Mother that Queen is! The liturgical calendar becomes strangely sanguinary just after Christmas Day. The second day of the Octave is the “Feast of Stephen,” that saintly deacon and protomartyr who heads up a bloody band to salute the newborn King. Then comes His Apostle and Evangelist, Saint John, on December 27, a martyr in all but his actual death; followed by the Holy Innocents; followed by Saint Thomas a Becket, the martyred Bishop of Canterbury. The feast of the Holy Innocents, known also as Childermas (the Mass of the Children, as Christmas is the Mass of Christ), celebrates those little Jewish boys of Bethlehem who had the honor of being mistaken for Christ. The Church, in her liturgy, gives them the graceful name flores martyrum, “flowers of the martyrs.” The hymn whence come these words has been set to music by Michael Haydn, younger brother of the more famous Franz Joseph Haydn. Speaking of musical tributes, let us not forget that the melancholy 14th-Century Coventry Carol is in honor of the Holy Innocents. The carol is melancholy, but can also be called bittersweet, the sweet coming in at the end via the tonal device known as the “Picardy third.” As tragic as the slaughter of these innocents was, it remains part of salvation history — a divine comedy in the true sense of the word, as there is a happy ending. In our own day, the cults of Baal, Moloch, Tlaloc, and Herod’s selfish ambitions all continue in the abortion industry, which has — at least in some places — overt connections to the Satanic. But even when not explicitly Satanic, the abortion industry is playing the role of useful idiot for Satan. Ditto for the pharmaceutical industry’s production of chemical abortifacients and other methods of birth control. The demonic hatred of the Divine Child continues in the wicked practice of onanism, a mortal sin which is nearly pandemic in our day, at least in the developed world, which seeks Herod-like to impose it on poorer nations. Satan continues to attack and corrupt women as he did Eve. Strangely, his promises have become less attractive. Eve was promised to become like God. Via feminism, Satan promises the modern woman she can become just like men. What a bum deal! If only she is willing to sacrifice her femininity in the dark rites of abortion and contraception, she can forge her own destiny and become … enslaved in a Dilbert cubicle just like the male of the species! Maybe one day, she can even become president. And in fulfilling her ambitions and sacrificing children and family on the altar of feminism, this “liberated” woman unwittingly assists Satan in his attack on the Mother and Child. To restore the woman and the child — and marriage and the family — to their proper place, we need to restore the place of that Woman and that Child in our own hearts and souls. I said above that Satan continues to attack and corrupt women. Let nobody read into these words the idea that demons do not tempt men. That he does, and often, as he did in Eden, by using women. Men, if they be Christian men, and not completely corrupted by his wiles, will realize that their duty is to care for, respect, and protect women and children — for each is an image of that grand Image of Catholicity, given by God to Saint Joseph’s loving care.